Q. How easy is it to 'do it yourself'? A. I’ve come across many flooring disasters, typically these include machines gouging floors and damaging doors, burst radiator pipes and uneven sanding. The process of renovating a floor is a specialist craft that requires an in-depth, working knowledge of the many factors involved in ensuring that the best finish is achieved. If you haven’t done this before you run the risk of ruining the floor or harming yourself. Q. Is there much dust? A. Of course if you sand a floor dust will be created, however the machines we use have an internal vacuum that retains over 99% of the dust created, which gathers in a bag attached to the machine. Q. Will the floor look brand new? A. 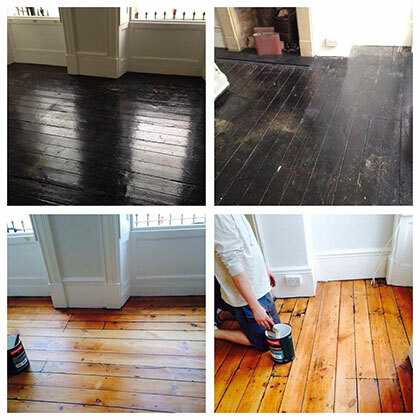 It does depend on the condition of the boards when we start - If your house is 300 years old with original floors, the chances are they’ve seen a considerable amount of traffic, and should be allowed to age graceful so we would treat them appropriately. If your house is an early 20th century terraced house you may have floorboards hiding under your carpet. These usually look fantastic after they’ve been treated. If you have a modern apartment with a two year old floor, then we can return it to the brilliance of your first encounter with it. Q. How noisy is it? A. It sounds like a big vacuum cleaner and we will close the door minimising the disruption to you. Q. We have dogs that have left their mark on our floor, deep scarring, stains and a bad odour. Will sanding solve this problem? A. Sanding the floor will effectively remove dirt, odours and the damage caused by pets, high heels or heavy furniture. Q. How does sanding fit in the decorating schedule? A. Generally sanding the floor should be left until the end. After any plumbing and the decorating has been finished! Q. Does the varnish leave smell? A. We use Polyurethane water-based sealant. These products have become the industry standard for treating wooden floors. They have low odour, are environmentally friendly, non toxic, non yellowing, quick drying and hard-wearing. A. An average size room, e.g. 12 by 12ft or 4m by 4m will take around 3 hours to sand. Then it depends on the finish and drying times etc. most of our work is completed in one day. Q. What colour will the floor be when it’s sanded? A. You can't really tell until you start sanding! Old pine floorboards have a glow to them and can vary from a reddish brown to a rich warm brown to a yellowish brown. The colour also depends on the climate the tree grew in before it was felled and how much sun light there is in the room. Block or strip floors are usually oak, beech, ash, maple, cedar or dark hardwoods mixed together and laid in a pattern such as herringbone or in a strip. If you have a particular colour in mind I can stain the floor to match your colour scheme. To ask a question visit us on Facebook!